The AFC Divisional Playoff game at Pittsburgh’s Heinz Field on January 15, 2005 appeared to be a mismatch. The Pittsburgh Steelers were perennial contenders under Head Coach Bill Cowher and had gone 15-1 during the 2004 regular season. 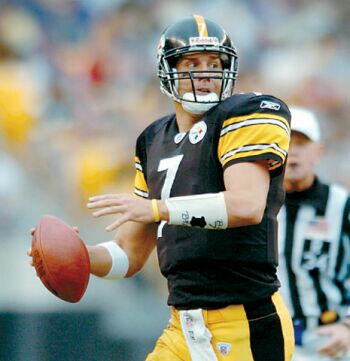 Rookie QB Ben Roethlisberger took over as the starting quarterback three games into the schedule when veteran Tommy Maddox was injured and was nothing short of sensational – the team won all 13 of his starts and he set rookie records by completing 66.4 % of his passes and compiling a 98.1 passer rating. He was helped by an outstanding ground game that featured the aging Jerome Bettis (pictured above) and newcomer Duce Staley, signed away from the Eagles. Pro Bowl WR Hines Ward was the most productive passing target. Most of all, the defense was the league’s best and contained Pro Bowlers in DE Aaron Smith, ILB James Farrior, OLB Joey Porter, and SS Troy Polamalu. The visiting New York Jets placed second in the AFC East with a 10-6 record and had just gotten past the Chargers in overtime in the Wild Card Playoff round to advance to the Divisional level. Under Head Coach Herman Edwards, the backfield contained the NFL’s leading rusher in RB Curtis Martin (1697 yards) and the Jets utilized a West Coast passing offense that was directed by QB Chad Pennington, who made up for a weak arm with accuracy and toughness (he was battling a sore shoulder that would require rotator cuff surgery in the offseason). The defense was not on a par with Pittsburgh’s but was aggressive and tough against the run. However, the Jets had scored just six points in each of their prior two games against the Steelers, including a few weeks earlier during the regular season, and were clear underdogs. Neither offense was able to get out of its own side of the field until midway through the first quarter when the Steelers drove 36 yards in seven plays. Jerome Bettis gained 17 yards in three carries and Ben Roethlisberger completed a pass to Hines Ward for 14 yards. Jeff Reed kicked a 49-yard field goal to give Pittsburgh the early 3-0 advantage. On the second play of New York’s next series, Chad Pennington was intercepted by Troy Polamalu, who returned it 15 yards to give the Steelers excellent field position at the Jets’ 25. Five plays later, Bettis ran three yards up the middle for a touchdown and, with the successful extra point, it was a 10-0 game. The Jets responded with a drive that extended into the second quarter and went 39 yards in 11 plays. Doug Brien’s 42-yard field goal attempt was successful and narrowed the score to 10-3. The Steelers went three-and-out in their next possession but, following a penalty on the punt return, New York started its next series at its own ten yard line. Pennington threw to WR Justin McCareins for a 30-yard gain but the promising drive finally stalled at the Pittsburgh 34 and the Jets punted. The Steelers also punted following a drive that netted 15 yards and WR Santana Moss (pictured below) returned it 75 yards for a touchdown that, combined with the successful PAT, tied the score at 10-10. That was still the tally at halftime. The teams traded punts to start the third quarter but the Steelers drove into New York territory in their second possession. Roethlisberger completed passes to Ward for 12 yards, WR Plaxico Burress for 17, and WR Lee Mays for eight yards in a third-and-three situation. But after reaching the New York 34, a pass by Roethlisberger was picked off by SS Reggie Tongue, who returned it 86 yards for a TD. Thanks to the big plays on the punt and interception returns, the Jets were ahead by 17-10 heading into the fourth quarter. The Steelers again advanced into New York territory but another turnover blunted a promising drive as Bettis uncharacteristically fumbled and FS Erik Coleman recovered at the 23. The Jets failed to get a first down and kicked the ball back to the Steelers, who started off from their 34 with 12:41 left in regulation. Pittsburgh put together another good drive, going 66 yards in 12 plays, and this time there were no turnovers. Roethlisberger took off for a 20-yard run to start the series which, with the exception of three short passes, stayed on the ground. Bettis and Duce Staley both carried the ball and the third of the passes was to Ward for a four-yard TD. Reed’s extra point tied the score at 17-17. The Jets now moved the ball effectively as Pennington connected with McCareins for a 22-yard gain and Curtis Martin for 17. However, after reaching the Pittsburgh 28 the resulting 47-yard field goal try by Brien struck the goal post and was unsuccessful. But the Jets got the ball back right away when a Roethlisberger pass was intercepted by CB David Barrett and returned 25 yards to the Pittsburgh 36. It seemed as though the Jets had the game in hand as they chipped away to the 24 and, with time running out in regulation, lined up for another field goal attempt by Brien. The 43-yard kick, sailing far off the mark, was no good and the contest proceeded into overtime. The Jets had the first possession in overtime and had to punt from their 41. Following WR Antwaan Randle El’s eight-yard return, the Steelers started off from their 13 yard line and went 72 yards in 14 plays. Along the way, Roethlisberger threw to Ward for a 17-yard gain on a third-and-six play and Pittsburgh converted a third-and-five situation thanks to a nine-yard run by RB Verron Haynes. Staley followed up with three carries for 17 yards to get the ball to the New York 24 and, after advancing further to the 15, Reed booted a 33-yard field goal – his 19th straight successful three-pointer – to give the Steelers a 20-17 win. Pittsburgh accumulated more total yards (364 to 275) and first downs (23 to 17). 193 of those yards came on the ground. However, the Steelers also turned the ball over three times, to one by the Jets, which nearly proved fatal. Ben Roethlisberger (pictured above) completed 17 of 30 passes for 181 yards and a touchdown but with two interceptions. Jerome Bettis led the running game with 101 yards and a TD on 27 carries while Duce Staley added 54 yards on 11 attempts. Hines Ward caught 10 passes for 105 yards and a score. For the Jets, Chad Pennington was successful on 21 of 33 throws for 182 yards with none for TDs and one intercepted. Curtis Martin rushed for 77 yards on 19 carries and caught four passes for 29 more yards. Justin McCareins led the club with 5 pass receptions for 82 yards. Thanks to the long return for a score, Santana Moss had 83 yards on punt returns to go along with his four catches for 31 yards. Doug Brien (pictured at right) achieved the dubious distinction of being the first placekicker in NFL history to miss two field goal attempts in the last two minutes of the fourth quarter of a playoff game; just the week before he had booted a field goal in overtime to beat the Chargers. Brien was let go by the Jets during the offseason, after they drafted PK Mike Nugent in the second round out of Ohio State. He was signed by the Bears but appeared in just three games before being dropped to thus end his 12-year NFL career. The Steelers advanced to the AFC Championship game, which they lost to the New England Patriots. They came back in 2005 with a lesser record, finishing the regular season as a Wild Card team, but went all the way to win the Super Bowl. The Jets dropped to 4-12 in an injury-plagued year before bouncing back to the postseason in ’06.